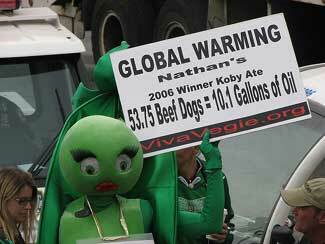 If You Were A Veggie Hot Dog, Would It Be OK To Eat Yourself? • God, the hot dog eating championships are fun. • John Patterson, get thee to Canada. Don't tell Spencer Hawes! • 45 seconds ... starting NOW. • Cursing at Yankee Stadium? Now we've seen EVERYTHING! • Dan LeBatard would like to keep Harold Reynolds away from his women. • MJD left us, but he is not forgotten. • Have Pete Rose's 30-year-old gum. • Stephon Marbury, absolutely not on crack. Nope. OK, that's all for us; we're gonna enjoy our little beach weekend getaway. Be nice to Sussman this weekend; help the guy out and make him feel welcome. And we'll see you Monday.